(Sorry if this has been brought up anywhere) But does anyone have tips for cleaning Alpacasso? I have the white backpack Alpacasso and I used to wear it every day when I went out, it's starting to look very dull and muddy colored and now so I'm less inclined to wear it and that makes me sad. My Eden also still doesn't look as clean as she could ever since my dog chewed on her, but I don't want to wash them too aggressively and potentially ruin their soft fur or make them all pilly. When I cleaned my Eden the first time I just ran her in hot water and brushed and gently blow dried her but she's still looking a little muddy colored around her snout, ears, and feet. I'm too afraid to use any kind of soap or detergent because I'm afraid I'll ruin my favorite paca ;m; I just want them to look shiny clean again haha. 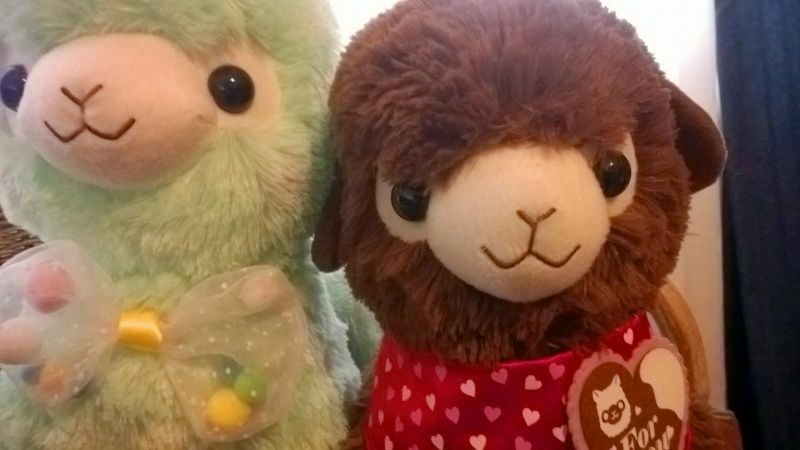 Olivia has a post about machine washing Alpacasso here and moccoe has a post about hand washing here. About pilling, I've used a razor, like for shaving legs, and shaved off pills from fabrics before. 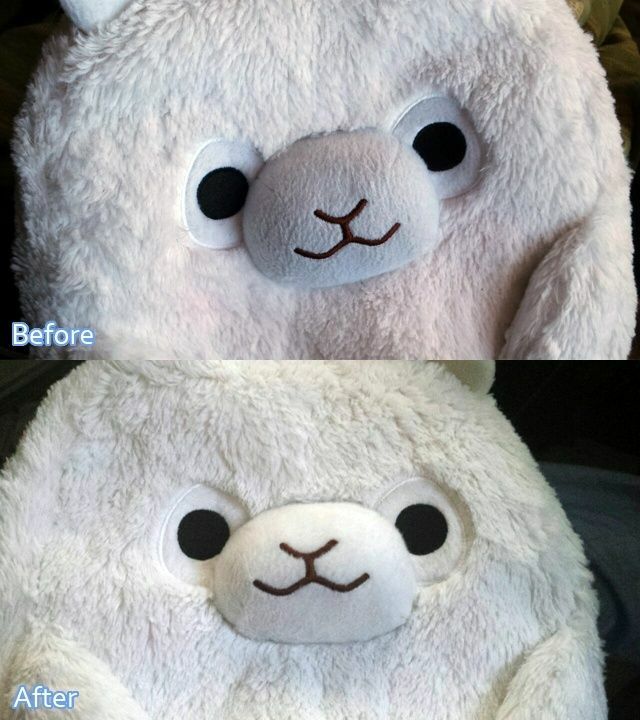 I'm not sure how it would work on the Alpacasso's face but if you're careful, it might help! Thanks grace for linking to my tutorial!! @ Lizbiz- the large Arpakasso are actually much sturdier than you think! Ive run almost all my large size ones through both the washing machine and drier, and all have come out perfectly! I even sometimes forget to use gentle detergent and they are fine. As stated in my tutorial, just dont forget to use 'no heat' settings!! I havent tried it with heat, but its safest to just avoid it all together. Perhaps one day ill buy a bootleg and see if anything bad happens with heat. Oh, and for pilling- I would personally not use a razor, as it actually shaves off the fur, and eventually you will have a bald spot on the muzzle/ears/feet. Soreyal has a great solution for pilling. She let everyone in on her secret to use these lint brushes from Rosy. I have some of these brushes myself, and they get rid of pilling with just a few swipes!! It doesn't remove the pills either, it actually 'unknots' the pills, returning them to regular fur. (if that makes sense?) Ill upload a picture of what I mean in a few minutes. Oh wow, I never knew about the brush! I might have to get one later... Thanks so much for the tip Olivia! Okay! I quickly brushed one of my super pilly arpakasso. Here are the results! On the left of each set is after brushing, and on the right is before. Top are his ears (squished together to compare), middle is feet, bottom is face. I haven't even gotten my first pay check yet ;A; it's just I've been looking for a solution for Tadashi's pilling! Yeah it is definitely on the expensive end but I really loved how cute it was and I wanted to get my first swimmer item! Also supporting Rosy is always a plus for me (and it gave me an opportunity to buy a san-x mini mystery bag!) but like Lumi said you can find cheap ones pretty much anywhere! Adorable! Congrats on your restored backpack! 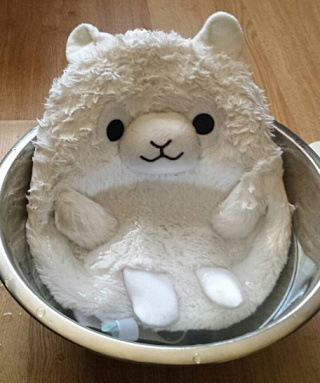 Lizabiz, your backpack looks super cute sitting in the tub! 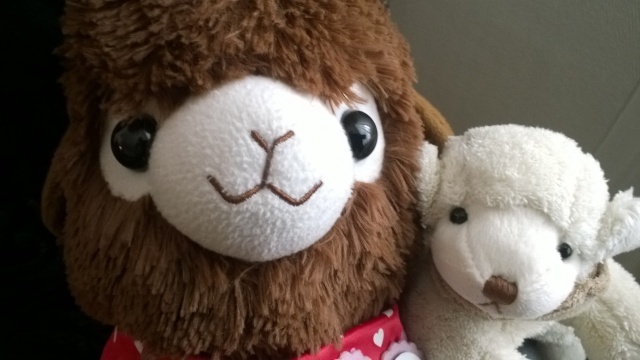 Thank you so much for starting this thread ;w; I've always had problems with keeping my pacas clean since my room is super dusty (blah) and alpacasso are basically dust magnets... I also can't machine wash my alpacasso because I don't have a dryer or an area where I can put them out to dry under the sun.. I usually just wipe them over with wet tissue. I have a lint remover brush (not the one from Rosy), but it tends to pull out some of their fur when I brush them? I know they have a lot of fur, and the brush doesn't pull out large clumps, but I don't know if this is normal or if I'm just brushing too hard!? I try to be as gentle as I can though ;w; also I didn't know you could brush pilling out! Definitely going to try that out. Aww! its so cute and confused looking in there!! And wow, looks great! @ Alpcaxy- That shouldn't happen! I use the one from Rosy, and no hair ever comes out! Im not not that gentle D: Does your have the same red brissles? Ah I might actually get a lint brush - seems like Rosy is sold out at the moment. My poor Señor Bon Bon has been getting too much cuddles and it's really obvious that he needs to be brushed by now. I do think it gets on the Kid's and Baby's faces easier since they're smaller, the muzzle just rubs against your clothes very easily. This really worked rather well! His face is almost 100% back to smooth fabric! Hurray! It also looks nice when used on their fur. My white Beri baby reeeally needs a wash, he looks all stringy and kinda gray. But he's my favorite one so I am worried about washing him! I have washed a lot of stuffed animals before, usually I put them in a pillowcase and tie it with a rubber band and then put them through the wash. I've never done it with alpacas though. And the Beri boy doesn't have any elaborate accessories, just his bow and berries.. But I'm worried..! Should I go for it? I have washed almost all my large ones, but none have accessories, so im not sure. However, I've washed clothes with delicate beading and nothing bad happened to them! I would say go for it if your washing machine has a 'delicate' setting! I got mine at the dollar tree to be honest! Black handle with red brush part!